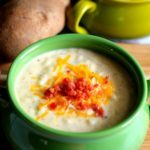 Delicious and easy Loaded Baked Potato Soup Recipe. One of my all time favorite soup recipes. Place a large pot of water on the stove and add in the peeled and cubed potatoes. Get the water up to a boil, and then boil for 20 minutes, or until potatoes are cooked. Remove from heat and drain water. Place to the side. In a medium pot over medium-high heat melt butter and sautee onion for 6 minutes. Add in the flour and using a whisk, mix well for 30 seconds to one minute. Gradually start whisking in the milk, about 1/2 cup to a cup at a time, constantly stirring. You want to keep whisking and adding milk and stirring. Bring to a boil, and then turn heat down to medium and allow the mixture to simmer for 8-10 minutes until thickened. Stir in the potatoes and cook for an additional 5 minutes. Add in the cheese, salt and pepper, sour cream and stir well. Remove from heat and allow to cool slightly before serving. Top with additional sour cream, cheese, and bacon bits if desired.